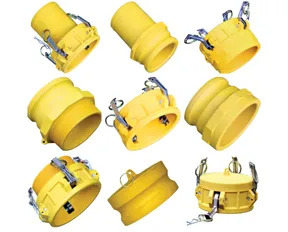 Bee Valve Inc.’s 4” Heavy-Duty 404 Series Nylon Couplers/Adapters have a heavier wall construction for greater strength. All 404 Series couplers come standard with four stainless steel handles for a secure connection in high-pressure applications. The fittings are constructed in glass-reinforced nylon for weight reduction, with the strength to resist cross threading, thread seizure, and “out-of-round” condition. The non-conducting nylon fittings are chemical resistant to most acids and are interchangeable with other couplers and adapters manufactured to MIL-spec. Bee Valve manufactures low-pressure fluid control and handling products, offering a complete line of ball valves, couplers, adapters, strainers, and fittings.